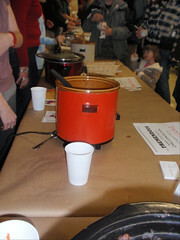 The second annual Clintonville Chili Bowl was a huge success! The initial count was one hundred and fifty paid admissions (plus judges, chili makers, chili maker groupies,…) grossing over $600 for the Clintonville Community Resource Center. 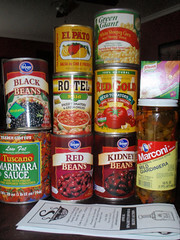 Twenty plus interpretations of chili were ladled out including a house chili. Cornbread and a bake sale balanced out the meals. I had mentioned I was coming to win. I decided Friday morning to go with a populist approach – using my two sided crock pot I made mild and wild versions of a buffalo, steak and (last minute addition) Italian sausage chili. The bases of both were the same – Mild had corn while Wild mixed in Giardinera, some ancho chili sauce and a few other spicing variations. I spent the evening sandwiched between Jenni and Sarah from Pattycake Bakery with their killer vegan chili (I asked – there will not be chili or cornbread at Pattycake) and Pam from Food for Thought, Food for the Soul with her family friendly chili (and samples of her mom’s perfect Pineapple Upside Down Cake and pies). The winning chili was from Weilands with a score of 64. Tim from Weiland’s tells me that we can not expect this CCB chili to be on their lineup since the price point per serving would be out of most people’s pocketbooks. There was a tie for second place with two scores of 63 (Wild). There was a score of 62.5 (Mild). It was a tight race, every chili I sampled was superior. Next year I plan on goat chili. Expect another chili bowl next year. 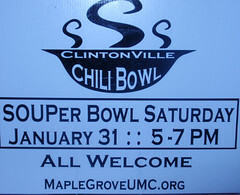 Keep your eyes peeled for Clintonville’s second run at the World’s Record for the biggest potluck in 2009. Some interviews were obtained at the event and may be on Columbus Foodcast in February or early March. This entry was posted on February 1, 2009 at 11:56 AM	and is filed under Clintonville, events. Tagged: Clintonville Chili Bowl. You can follow any responses to this entry through the RSS 2.0 feed. You can leave a response, or trackback from your own site. CMH GOURMAND’s chili claims Chili Bowl! Ahem. How did you manage to leave out the WHO on second place? Did I read too fast? YOU. Out of 27 batches, you bested all but the chef at Weiland’s. Congrats! Here I always thought you were more of a consumer than creator. Seems like you should eat in more. jennie and i were really glad that we were next to you! Congratulations on your 2nd place finish and thank you so much for making sure my bag got back to me! CMHG Comment: My pleasure Sarah. COngrats!! 2nd and 3rd is AWESOME!! I was TOTALLY going to come, on my calendar and everything, but just got over a wicked stomach bug and…lots and lots of chili wasn’t going to go over well at all. CMHG Comment: Even more tragic was me “taking a short nap” before the Pattycake Bakery workshop at Wild Goose Creative on Sunday and waking up an hour after it was over. Congratulations! Did you get a trophy?! It was nice meeting you at the Pig Iron last week. Hope to see you soon for lunch! CMHG Comment: No trophy just street credibility.